The main entrance leads from a south facing patio into a charming lounge. 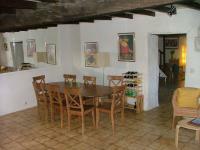 There is a large separate dining room and a fully fitted kitchen with gas and electric cooking, dishwasher etc. In the lounge is a long settee which can be converted into a further single bed. Leading off the lounge is a garden room with French windows that open onto the patio. Within this room there is also a settee that can be converted into another bed. Stairs lead from the lounge to the upstairs accommodation which consists of two double bedrooms, one twin bedroom and an area which can be converted into a twin-bedded section for children, although at a push it can be used by adults. The owners have used it as such very comfortably. There are two bathrooms, one upstairs with bath and toilet and one downstairs with shower and toilet. Step outside the house onto a very nice patio which faces south and is a wonderful sun-trap. Adjacent is an 8 x 4 m private swimming pool. The large garden is very pretty and has a large walnut tree providing shade when the weather is hot and sunny.